It’s perhaps appropriate that Murder on the Orient Express and Thor:Ragnarok were released in two consecutive weeks, because we can draw a very real comparison between the two. Last week, I noted that the first Thor was my favorite Marvel film, in large part due to the classical storytelling inspiration of director Kenneth Branagh. I then compared it to Thor: Ragnarok, a movie made to cater to the modern mindset, the attention-impaired cultural generation, where everything must be fun, funny, and exciting, but storytelling suffers. What made the first Thor so great was precisely that refusal to cater to modern sensibilities the way that Thor: Ragnarok did. And in recreating a classic like Murder on the Orient Express, I’m sure there was a temptation to do exactly that: make it fit with the current mindset. And in the hands of a lesser artist, it might have turned out that way. But with Murder on the Orient Express, Kenneth Branagh does it again. He is a writer, director, and actor that understands one simple principle: classic storytelling doesn’t age. If you tell a story in a classic way, it will live forever. But if you try to force your story to cater to the current cultural whims of the audience, it will date faster than you can imagine. This is a lesson Hollywood keeps forgetting. Which is one reason why they keep remaking the same properties over and over again. And before you object, it should be noted there is a big difference between refilming a classic story for a new generation, and rebooting a franchise every few years. One is necessary to preserve an already great story in the mind of the culture. The second is a defiency of good storytelling. All of that being said, there are three things, I think, that make Murder on the Orient Express a fantastic film. First, Agatha Christie. How do you make a great film? You start with a great story. 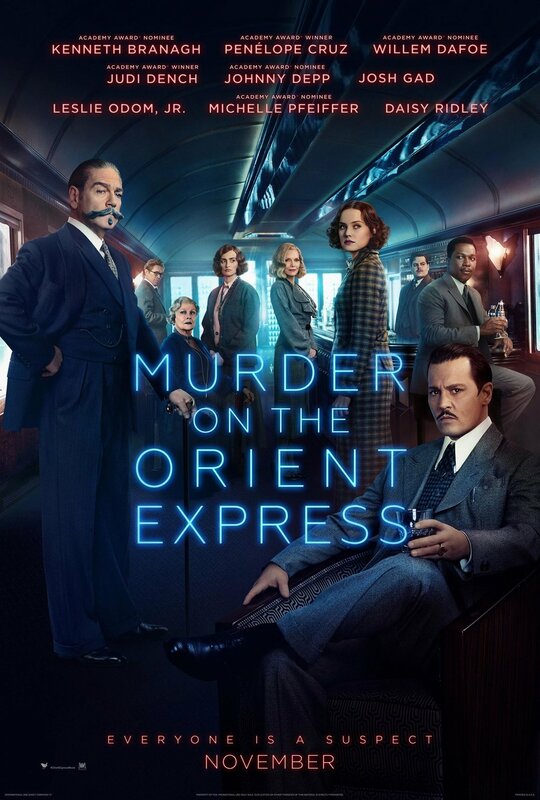 Christie is not only the greatest murder-mystery writer of all time, but in Murder on the Orient Express, she created a story that has become so ingrained in the culture that almost everyone has an idea of what it is, even having never read the book or seen the original movie. She created a story that is a timeless classic. Second, the cast. How this cast came together is a miracle that I find hard to believe. It seems too good to be true that we should ever see this much star-power and talent in one film. Each member of the cast gives a stellar performance, bringing each suspicious and engaging character on that train to life before the audience’s eyes. First, Branagh plays Hercule Poirot, the world’s greatest detective, and does so to perfection. He is brilliant, charming, and is endearing even in his rudeness. You cannot help but fall in love with the character. He carries the movie, and amidst a cast as vast and talented as the one indwelling this film, that is a feat of olympian greatness. He is at turns funny, tragic, and forceful, and imbues the film with a heart and a gravitas that a lesser actor could only dream of. Watching Branagh in Murder on the Orient Express is to watch pure talent in motion. But the fact that Branagh is just as much of a powerhouse behind the camera as he is in front of it is something I still have trouble wrapping my head around. Every frame of this film is beautifully crafted, from the beginning to the end. Not only is it gorgeous, it utterly succeeds at bringing to the screen one of the greatest mysteries ever written. It is a wonder to behold. It is the antithesis of a movie like Thor: Ragnarok, one that does not insult the audience, but asks it to participate. Branagh never shows us anything that we don’t need to see, trusting his audience to think and fill in the gaps the movie willfully creates to keep us engaged. The story and the film also does not shy away from doing what a good story does: examining what is darkest in human nature. And it asks real, intelligent, deep-hearted questions about justice, morality, good and evil, right and wrong. And it leaves those questions in the audience’s mind after the credits roll, questions that we would all be better human beings for asking. Murder on the Orient Express is absolutely marvelous, a joy to watch from opening to close. It is a film made with the very best in front of and behind the camera. It is a film that breathes new life into a classic story, and in so doing, becomes an instant classic itself. It’s one of the best films I’ve seen this year, and I envy anyone who does not know the twists and turns in store for them when the lights go down.